The original pdf version of this document is available here (6 Mb file). WHEREAS, the Town of Union adopted a temporary stay on August 2, 2007 concerning the construction of large wind energy systems to give the Town time to research and develop an appropriate ordinance. WHEREAS, the Town of Union appointed a Large Wind Turbine Study Committee on August 30, 2007 to study wind energy systems and make written recommendations to the Plan Commission on regulations to adopt. WHEREAS, the Large Wind Turbine Study Committee held 14 public meetings from September 2007 through January 2008 to research the health and safety effects of large wind turbines. WHEREAS, the Large Wind Turbine Study Committee prepared a Setback Recommendation Report dated January 6, 2008 and a draft Large Wind Systems Licensing Ordinance (the "Ordinance") that was presented to the Plan Commission on January 31, 2008. WHEREAS, on January 31, 2008 the Plan Commission requested the Town attorney conduct a preliminary review of the draft Ordinance and provide comments to the Town Board. The Town attorney provided such comments to the Plan Commission and Town Board on February 25, 2008. On March 6, 2008, the Town Board requested that the Large Wind Turbine Study Committee review and address the Town attorney's comments concerning the draft ordinance. The Large Wind Turbine Study Committee submitted a revised draft Ordinance to the Plan Commission on April 26, 2008. WHEREAS, the Plan Commission and Town Board held public hearings on May 29, 2008, June 5, 2008 and June 26, 2008 concerning the revised draft Ordinance. WHEREAS, reputable studies and research projects have been conducted regarding large wind turbines. Alberts, Daniel,� A Primer for Addressing Wind Turbine Noise", Lawrence Technological University, November 20, 2005 . Alves-Pereira, Mariana and Branco, Nuno A.A. Castelo. "In-home Wind Turbine Noise is Conducive to Vibroacoustic Disease", Wind Turbine Noise Conference, September 20, 2007. Bajdek, Christopher, "Communicating the Noise Effects of Wind farms to Stakeholders", Noise-Con 2007, October 22-24, 2007 . Burton, Tony, et al., "Wind Energy Handbook", 200l. French National Academy of Medicine, Report and Recommendations from Work Group, "The Repercussions of Wind turbine Operation on Human Health", March 14, 2006. Frey, Barbara� J. and Hadden, Peter J., "Noise Radiation from Wind turbines Installed Near Homes: Effects on Health", February 2007. Harding, Graham, et al. "Wind Turbines, Flicker, and Photosensitive Epilepsy: Charactenzing the Flashing that may Precipitate Seizures and Optimizing Guidelines to Prevent Them", Epilepsia: 1 -4, 2008. Harry, Amanda, MD. "Wind Turbines, Noise and Health", February 2007.
International Standards Organization, 1996-1971 Recommendations for Community Noise Limits. James, Richard. Testimony of Richard James, noise control consultant and acoustical consultant, Tazewell County Illinois Zoning Board of Appeals Hearing, May 1,2008. Kamperman, George and James, Richard, "Simple Guidelines for Siting Wind turbines to Prevent Health Risks", Noise-Con 2008, August 2,2008. Kamperman, George and James, Richard, "The How To Guide to Criteria For SitingWind turbines to Prevent Health Risks From Sound", July 30, 2008. Leventhall, Geoff; �"A Review of Published Research on Low Frequency Noise and its Effects", Department for Environment, Food and Rural Affairs, UK (2003). National Research Council, National Academy of Sciences, "Environmental Impacts of Wind Energy Projects", May 2007. National Wind Coordinating Committee, "Permitting of Wind Energy Facilities", 1998. Pedersen, E., et al., "WINDFARM perception - Visual and Acoustic Impact of Wind Turbine Farms on Residents, Final Report", June 3, 2008. Pedersen, Eja and Person Waye, Kerstin, "Wind Turbine Noise, Annoyance and Self- Reported Health and Well-being in Different Living Environments", Occup Environ Med, May 1, 2007, 64:480-486. Pedersen, Eja, "Human Response to Wind Turbine Noise - Perception, Annoyance and Moderating Factors", Goteburg University, 2007 . Pedersen, Eja, et al., "Noise Annoyance from Wind Turbines - a Review", Swedish Environmental Protection Agency Report 5308, August 2003. Pedersen, Eja and Persson Waye, Kerstin, "Wind Turbines - Low Level Noise Sources Interfering with Restoration?" Environmental Research Letter Journal 3 (January -March 2008), published January 11, 2008. Pierpont, Nina MD, PhD, "Wind Turbine Syndrome: Noise, Shadow Flicker and Health", August 1, 2006. Rogers, Anthony L., PhD., et al., "Wind Turbine Acoustic Noise White Paper", University of Massachusetts Renewable Energy Research Lab, June 2002, amended January 2006. State of Wisconsin 2007 Draft Model Wind Ordinance and Reference Guide. Stewart, John, "Location, Location, Location - An Investigation into Wind Farms and Noise by the Noise Association", UK Noise Association, June 2006. Town of Union Large Wind Turbine Study Committee Setback Recommendation Report, January 6, 2008. Van den Berg, G.P., "Effects of the wind profile at night on wind turbine sound", Journal of Sound and Vibration Volume 277 (2004) 955-970. Western Australian Planning Commission. "Guidelines for Wind Farm Development", Planning Bulletin No. 67, ISSN 1324-9142, May 2004. World Health Organization Technical Meeting on Sleep and Health, Bonn Germany, 22-24 January 2004. WHEREAS, the Plan Commission conducted six working meetings, in addition to time devoted at regular Plan Commission meetings, to develop a final draft ordinance for recommendation to the Town Board, and on October 30, 2008, recommended that the Town Board adopt this Ordinance. 1. Wind energy is a potential renewable and nonpolluting energy resource of the Town of Union, and its conversion to electricity may reduce dependence on nonrenewable, conventional energy sources and decrease the pollution that results therefrom. However, wind energy facilities should be sited in a way that protects the health and safety needs of the Town of Union residents residing near the large wind turbines, as well as the general public. 2. The regulation of the siting and installation of large wind turbines is necessary to protect the health, safety and welfare of the residents of the Town of Union and the general public. Adverse health and safety issues are likely to arise if appropriate standards and setbacks are not followed in the siting and installation of large wind turbines. 3. It is appropriate to consider as relevant recommended standards for large wind turbines from international organizations that have more experience with the use, siting and installation of large wind turbines than the U.S.
4. Wind turbine accidents have occurred involving ice throws, blade disintegration, fire and tower failure. According to the Caithness Windfarm Information Forum, from 1999 through June 2008 there were over 500 accidents around the world, including North America, involving ice throws, blade disintegration, fire and tower failure from large wind turbines. 5. If improperly sited, wind energy systems produce electro-magnetic radiation that can interfere with broadcast communications and signals. 6. Heavy equipment used for the construction of large wind turbines can damage local roads. 1. Large wind turbines are significant sources of noise, which, if improperly sited, can negatively impact the health of residents, particularly in areas of low ambient noise levels. 10. Eye-witnesses living near newly-constructed large wind turbines in the Town of Byron, Fond du Lac County, WI testified at the public hearing held by the Town of Union Plan Commission that they currently experience adverse health effects from the wind turbine noise such as sleep deprivation and disturbance, headaches, nausea and dizziness. The SPL from the wind turbines in the Town of Byron is greater than 45 dBA at their residences and can be heard inside of their houses and outside in their yards. 11. Two Plan Commissioners visited the newly constructed wind turbines in the Town of Byron, Fond du Lac County, WI in June 2008 and confirmed that the wind turbines were a significant source of noise. Doug Zweizig went to Gerry Meyer's home that was approximately 1500 feet from the wind turbines and noted that the turbines sounded like a jet airplane when describing the quality and intensity of the sound. Dave Pestor spoke with residents, farmers and a sheriff's deputy in the area who all stated that the turbines were noisy. Mr. Pestor also visited Gerry Meyer's home and took sound measurements from the wind turbines. The sound measured between 57 to 67 dBA on June 6-7, 2008. Mr. Pestor took sound measurements from several wind turbines in the area. The lowest sound measurement was 48 dBA and the highest was 69 dBA. Wind Committee members, Jim and Cathy Bembinster visited the Monfort, WI wind turbines in August 2007 and measured the sound levels to be between 48 to 53 dBA and 62-73 dBC. They also found two pieces of broken blades, with the tip of the blade being as big as the hood of a truck. The Bembinsters visited Monfort again in November2}}7 and measured the sound above 50 dBA and 65 dBC. However, experiences vary. Kim Gruebling visited wind turbine sites in Byron township, Lincoln township and Monfort and found that overall people were satisfied with the turbines. Two issues that Mr. Gruebling noted were 1) tensions between landowners profiting from the wind turbines and those landowners who did not, and 2)the poor conditions of roads following the installation of the turbines. Doug Lee visited wind farms in Iowa. Mr. Lee estimates that approximately 60% of the people he spoke with had positive opinions of the wind turbines and approximately 40% of the people he spoke with had negative opinions of the wind turbines. Eric Larsen went to a wind farm south of Rockford, IL. No one was available to talk so he walked around the area. It was a nice day and windy. Mr. Larsen noticed that the windows in the homes surrounding the site were all closed and no one was outside. He stated the noise was similar to a plane going overhead. He stood under a tower and did not feel any unease. While this model of sound propagation is descriptive of the noise generated by the machinery at the hub, the noise produced by the turbine blades is not accounted for in this model and has been found to travel further. Therefore, this ordinance requires siting based not only on set-backs, but also on sound studies. 9. Wind turbines have been known to throw ice and debris from the turbine blades. According to Professor Terry Matilsky from the Department of Physics and Astronomy at Rutgers University, ice throws from large wind turbines can reach up to a distance of 1750 feet and blade throws can reach 2500 feet. Based upon the findings stated above, it is the intended purpose of the Town to regulate Wind Energy Systems to promote the health, safety, and general welfare of the citizens of the Town and to establish reasonable and uniform regulations for the operation thereof so as to minimize potentially dangerous effects of Wind Energy Systems on the community. (a) Aerodynamic Sound means a noise that is caused by the flow of air over and past the blades of a WES. (b) Ambient Sound. Ambient noise encompasses all sound present in a given environment, being usually a composite of sounds from many sources near and far. It includes intermittent noise events, such as, from aircraft flying over, dogs barking, wind gusts, mobile farm or construction machinery, and the occasional vehicle traveling along a nearby road. The ambient also includes insect and other nearby sounds from birds and animals or people. The near-by and transient events are all part of the ambient sound environment but are not to be considered part of the background sound. If present, a different time or location should be selected for determining the L90 background sound levels. (c) �Anemometer means a device for measuring the speed and direction of the wind. (d) Applicant means the individual or business entity that seeks to secure a license under this Ordinance. (e) A-Weighted Sound Level (dBA). A measure of over-all sound pressure level designed to reflect ih" tesponse of the human ear, which does not respond equally to all frequencies. It is used to describe sound in a manner representative of the human ear's response. It reduces the effects of the low with respect to the frequencies centered around 1000 Hz. The resultant sound level is said to be A-weighted and the units are dBA. Sound level meters have an A-weighting network for measuring A-weighted sound levels (dBA) meeting the characteristics and weighting specified in ANSI Specifications for Integrating Averaging Sound Level Meters, 51.43-1997 for Type I instruments and be capable of accurate readings (corrections for internal noise and microphone response permitted) at 20 dBA or lower. (f) Background Sound (L90) refers to the sounds that would normally be present at least 90% of the time. Background sounds are those heard during lulls in the ambient sound environment. That is, when transient sounds from flora, fauna, and wind are not present. Background sound levels vary during different times of the day and night. Because a WES operates 24/7, the background sound levels of interest are those during the quieter periods which are often the evening and night. Sounds from near-by birds and animals or people must be excluded from the background sound test data. Background sound level (dBA and dBC (as L90)) is the sound level present for at least 90% of the time during a period of observation that is representative of the quiet time for the soundscape under evaluation and with duration of ten (10) continuous minutes. Several contiguous ten (10) minute tests may be performed in one hour to determine the statistical stability of the sound environment. Longer term tests, such as 24 hours or multiple days are not appropriate since the purpose is to define the quiet time background sound level. It is defined by the L90A and L90C descriptors. It may be considered to be the quietest one (1) minute during a ten (10) minute test. L90A results are valid only when L10A results are no more than 10 dBA above L90A for the same time period. L10C less L90C should not exceed 15 dBC to be valid. Measurement periods such as at dusk when bird and insect activity is high or the early morning hours when the 'dawn chorus' is present are not acceptable measurement times. Further, background L90 sound levels documenting the pre-construction baseline conditions should be determined when the ten minute average wind speed is 2 meters per second (4.5 mph) or less at the ground level/microphone location. (h) C-Weighted Sound Level (dBC). Similar in concept to the A-Weighted sound Level (dBA) but C-weighting does not de-emphasize the frequencies below lkHz as A-weighting does. It is used for measurements that must include the contribution of low frequencies in a single number representing the entire frequency spectrum. Sound level meters have a C-weighting network for measuring C-weighted sound levels (dBC)meeting the characteristics and weighting specified in ANSI S1.43-1997 Specifications for Integrating Averaging Sound Level Meters for Type 1 instruments. (i) Decibel (dB). A dimensionless unit which denotes the ratio between two quantities that are proportional to power, energy or intensity. One of these quantities is a designated reference by which all other quantities of identical units are divided. The sound pressure level (Lp) in decibels is equal to 10 times the logarithm (to the base 10) of the ratio between the pressure squared divided by the reference pressure squared. The reference pressure used in acoustics is 20 MicroPascals. (j) Distance attenuation. Means the reduction of a sound or attenuation by distance. The effect of distance attenuation depends on the type of sound sources. Most sounds or noises we encounter in daily life are from sources which can be characterized as either point or line sources. If a sound source produces spherical spreading of sound in all directions, it is a point source. For a point source, the noise level decreases by 6 dB per doubling of distance from the source. If the sound source produces cylindrical spreading of sound such as a stream of motor vehicles on a busy road at a distance, it may be considered as a line source. For a line source, the noise level decreases by 3 dB per doubling of distance from the source. (k) �Frequency. The number of oscillations or cycles per unit of time. �Acoustical frequency is usually expressed in units of Hertz (Hz) where one Hz is equal to one cycle per second. (l) Good Utility Practice. Means any of the practices, methods and acts with respect to the safe operation of a WESF engaged in or approved by a significant portion of the electric utility industry and, in particular, those portions of the industry with experience in the construction, operation and maintenance of wind turbines during the relevant time period; or any of the practices, methods and acts which, in the exercise of reasonable judgment in light of the facts known at the time the decision is made, could be expected to accomplish the desired result at a reasonable cost consistent with good business practices, reliability, safety and expedition. Good Utility Practice is not intended to be limited to the optimum practice, method or act to the exclusion of all others, but rather to be acceptable practices, methods or acts generally accepted in the region. (m) Health means a state of complete physical and mental well being, not merely the absence of disease or infirmity. This definition was adapted from the World Health Organization definition of health in "Guidelines for Community Noise", pages 19 and20. (n) Height means the total distance measured from the grade of the property as existed prior to the construction of the wind energy system, facility, tower, turbine, or related facility at the base to its highest point. (o) Hertz (Hz) Frequency of sound expressed by cycles per second. (p) �Impulsive Sound refers to short-term acoustical impulses typically lasting less than one second each. It may be the only sound emitted from a noise source or it may be a component of a more complex sound. For evaluation of wind turbines, impulsive sound includes swishing or thumping sounds. (q) INCE means Institute of Noise Control Engineers. The Institute of Noise Control Engineering of the USA ("INC/USA") is a non-profit professional organization incorporated in Washington, DC. A primary purpose of the INCE/USA is to promote engineering solutions to environmental, product, machinery, industrial and other noise problems. INCE/USA is a Member of the Society of the International Institute of Noise Control Engineering, an international consortium of organizations with interest in acoustics and noise control. (r) �Infra-Sound. Sound with energy in the frequency range of 20 Hz and below is considered to be infrasound and is normally considered to not be audible unless in relatively high amplitude. The most significant exterior noise-induced dwelling vibration occurs in the frequency range between 5 Hz and 50 Hz. Moreover, even levels below the threshold of audibility can still cause measurable resonances inside dwelling interiors. Conditions that support or magnify resonance may also exist in human body cavities and organs under certain conditions, although no specific test for infrasound is provided in this document, its presence will be accounted for in the comparison of dBA and dBC sound levels for the complaint test provided later in this document. See low-frequency sound (LFN) for more information. (s) �Low Frequency Sound (LFN) refers to sounds with energy in the lower frequency range of 20 to 200 Hz. LFN is deemed to be excessive when the difference between a C-weighted sound pressure level and an A-weighted sound pressure level is greater than20 decibels at any measurement point outside or inside a noise sensitive receptor site, residence, or other occupied structure. E.G. C-A>20 dB. (t) Measurement Point (MP) means location where sound and/or vibration measurements are taken such that no significant obstruction blocks sound and vibration from the site. The Measurement Point should be located so as to not be near large objects such as buildings and in the line-of-sight to the nearest turbines. Proximity to large buildings or other structures should be twice the largest dimension of the structure, if possible. (u) Measurement of Wind Speed. For measurements conducted to establish the background sound pressure levels (dBA, dBC, L90 10 min, and etc.) the wind speed at the microphone's Measurement Point shall average 2m/s (4.5mph) or less for valid background measurements. For valid measurements conducted to establish the post-construction sound level the wind speed at the microphone's Measurement Point shall not exceed 4 m/s (9 mph) average and the wind speed at the WES blade height shall be at or above the nominal rated wind speed. For purposes of enforcement, the wind speed and direction at the WES blade height shall be selected to reproduce the conditions leading to the enforcement action while also restricting wind speeds at the microphone to 4 m/s (9 mph). For purposes of models used to predict the sound levels and sound pressure levels of the WES to be submitted with the Application, the Wind Speed shall be the speed that will result in the worst-case dBA and dBC sound levels in the community adjacent the nearest WES. For the purpose of constructing the model the wind direction shall consider the dominant wind direction for the seasons from the late Spring to early Fall. If other wind directions may cause levels to exceed those of the predominant wind direction at nearby sensitive receptors, these levels and conditions shall be included in the Application. (v) Mechanical Noise means sound produced as a byproduct of the operation of the mechanical components of a WES(s) such as the gearbox, generator and transformers. (w) Noise means any unwanted sound. Not all noise needs to be excessively loud to represent an annoyance or interference. (x) Non-Participating Parcel means a parcel of real estate that is neither a Project Parcel nor a Participating Parcel. (y) Occupied Structure means a building in which people live, work or frequent. 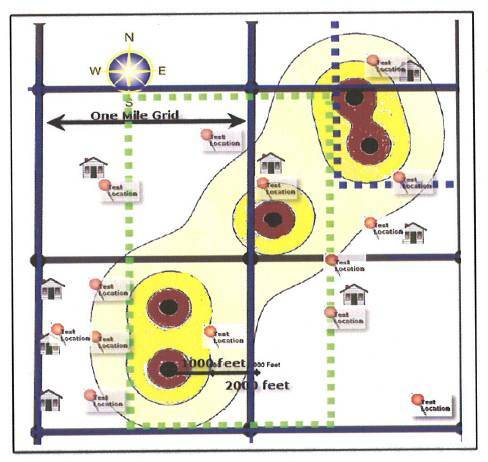 (z) Participating Parcel means a parcel of real estate that is not a Project Parcel, but is subject to an agreement between the owner and applicant allowing the construction of all or part of a WESF closer to a Participating Parcel property line or structure on the Participating Parcel than would be permitted under this Ordinance in the absence of such an agreement. To qualify as a Participating Parcel, the agreement between the owner and the applicant must be approved by the Town Board under this Ordinance. (aa) Project Boundary means the boundaries of the WESF as shown on the site plan submitted to and approved by the Town in accordance with this Ordinance. (bb) Project Parcel or Project Parcels means the parcel or parcels of real estate on which all or any part of a WESF will be constructed. (cc) Property Line means the recognized and mapped property parcel boundary line. (dd) Pure Tone. �A sound for which the sound pressure is a simple sinusoidal function of the time, and characterized by its singleness of pitch. Pure tones can be part of a more complex sound wave that has other characteristics. (ee) Qualified Independent Acoustical Consultant. �Qualifications for persons conducting baseline and other measurements and reviews related to the application for a WES or for enforcement actions against an operating WES include, at a minimum, demonstration of competence in the specialty of community noise testing and Full Membership in the Institute of Noise Control Engineers (INCE). Certifications such as Professional Engineer (P.E.) do not test for competence in acoustical principles and measurement and are thus not, without further qualification, appropriate for work under this Ordinance. The Independent Qualified Acoustical Consultant can have no direct or indirect financial or other relationship to an Applicant. (ff) Sensitive Receptor means places or structures intended for human habitation, whether inhabited or not, public parks, state and federal wildlife areas, the manicured areas of recreational establishments designed for public use, including but not limited to golf courses, camp grounds and other nonagricultural state or federal licensed businesses. These areas are more likely to be sensitive to the exposure of the noise, vibration, shadow or flicker, etc. generated by a WES or WESF. These areas include, but are not limited to: schools, daycare centers, elder care facilities, hospitals, places of seated assemblage, nonagricultural businesses and residences. (hh) Sound Power. The total sound energy radiated by a source per unit time. The unit of measurement is the watt. Abbreviated as Lw. This information is determined for the WES manufacturer under laboratory conditions specified by IEC 61400-11 and provided to the local developer for use in computer model construction. It cannot be assumed that these values represent the highest sound output for any operating condition. They reflect the operating conditions required to meet the IEC 61400-11 requirements. The lowest frequency is 50 Hz for acoustic power (Lw) requirement in IEC 61400-11. This Ordinance requires wind turbine certified acoustic power (Lw) levels at rated load for the total frequency range from 6.3 Hz to 10k Hz in one-third octave frequency bands tabulated to the nearest 0.1 dB. The frequency range of 6.3 Hz to 10kHz shall be used throughout this Ordinance for all sound level modeling, measuring and reporting. (ii) Sound Pressure. The instantaneous difference between the actual pressure produced by a sound wave and the average or barometric pressure at a given point in space. (jj) Sound Pressure Level (SPL). 20 times the logarithm, to the base 10, of the ratio of the pressure of the sound measured to the reference pressure, which is 20 micronewtons per square meter. In equation form, sound pressure level in units of decibels is expressed as SPL (dB) = 20 logp/pr. (kk) Spectrum. The description of a sound wave's resolution into its components of frequency and amplitude. The WES manufacturer is required to supply a one-third octave band frequency spectrum of the wind turbine sound emission at 90% of rated power. The published sound spectrum is often presented as A-weighted values. This information is used to project the wind farm sound levels at all locations of interest. Confirmation of the projected sound spectrum can be determined with a small portable one-third octave band frequency (spectrum) analyzer. The frequency range of interest for wind turbine noise is approximately 10 Hz to 10k Hz. (ll) Statistical Noise Levels. Sounds that vary in level over time, such as road traffic noise and most community noise, are commonly described in terms of the statistical exceedance levels LAN, where LAN is the A-weighted sound pressure level exceeded for N% of a given measurement period. For example, L10 is the noise level exceeded for 10% of the time. Of particular relevance, are: LA10 and LC10 the noise level exceed for 10% of the ten (10) minute interval. This is commonly referred to as the average maximum noise level. LA90 and LC90 the noise level exceeded for 90% of the ten (10) minute sample period. The L90 noise level is described as the average minimum background sound level (in the absence of the source under consideration), or simply the background level. Leq is the frequency-weighted equivalent noise level (basically the average noise level). It is defined as the steady sound level that contains the same amount of acoustical energy as the corresponding time-varying sound. (mm) Tonal Sound (sometimes referred to as Pure Tone). A sound for which the sound pressure is a simple sinusoidal function of the time, and characterized by its singleness of pitch. Tonal sound can be simple or complex. (nn) Wind Energy Systems (WES) means equipment that converts and then transfers energy from the wind into usable forms of energy on a large, industrial scale for commercial or utility purposes. Small scale wind systems of less than 170 feet in height with a 60-foot rotor diameter and a nameplate capacity of less than 100 kilowatts or less are exempt from this definition and the provisions of this Ordinance. (oo) Wind Energy Systems Facilitv or Facility or WESF means all of the land and equipment used by the Wind Energy System and its support facilities including the wind turbine, tower, access roads, control facilities, meteorological towers, maintenance and all power collection and transmission systems. (pp) Wind Energy Systems Facility License or WESF License means a license to construct and operate a Wind Energy System issued by the Town of Union in accordance with this Ordinance. (qq) Wind Turbine or Turbine (WTi) means a mechanical device which captures the kinetic energy of the wind and converts it into electricity. The primary components of a wind turbine are the blade assembly, electrical generator and tower. No Wind Energy System under 100 MW shall be constructed or operated in the Town without first obtaining a WES License in accordance with this Ordinance. (a) Applications for a WES License shall be submitted to the Town Clerk. The application shall include a completed application form as provided by the Town Clerk, and shall include all of the information, documents, plans, deposits and other things required to be submitted with an application under section 20.06 a preliminary cost-sharing agreement pursuant to section 20.07(c), and the payment required by section 20.07(b). (b) The Town Board shall, with assistance from such staff, consultants, committees or commissions as it deems appropriate, determine whether the application is complete and contains all of the materials, information, agreements, deposits and payments required to be submitted with an application under sections 20.06 and20.07. If an application is not complete, the applicant shall be so advised, and no further action shall be taken by the Town until a complete application is received. (c) After the Town Board determines that an application is complete, the Town Board shall determine whether the application meets all requirements of this Ordinance. In determining whether the application meets the requirements of this Ordinance, the Town Board may obtain assistance from such staff and consultants as it deems appropriate. The Town Board shall process the application as soon as reasonable and feasible, given the complexity of the application, other business facing the Town, staff and other resources, questions that arise during the review process, and other matters affecting the time needed to complete the review process. (d) If an application is complete and meets all requirements of this Ordinance, and the applicant has paid all fees and costs pursuant to section 20.07 of this Ordinance, the Town Board shall approve a WES License for the WESF, subject to the execution of a WESF licensing agreement pursuant to this Section. If an application does not meet all requirements of this Ordinance or the applicant has not paid all fees and costs pursuant to section 20.07, the Town Board may deny the application or approve the application with conditions that will assure compliance with this Ordinance. If an application is approved with conditions, a WES License for the WESF shall be issued when all conditions of approval have been satisfied. (e) The Town Board shall require an applicant to enter into a WESF licensing agreement with the Town as a condition of approving a WESF License. The WESF licensing agreement shall include all provisions deemed appropriate by the Town to assure that the WESF is constructed and operated, and that all fees, costs and sureties are paid and provided, as required by the Town Board and by this Ordinance. (f) If a WESF is not constructed within 30 months after a license is issued, the license shall expire. Information regarding the make and model of the turbines, Sound Power Levels (Lw) for each one-third octave band from 6.3H2 up through 10,000 Hz, and a projection showing the expected dBA and dBC sound levels computed using the one-third octave band sound power levels (Lw) with appropriate corrections for modeling and measurement accuracy tolerances and directional patterns of the WTi for all areas within and to one (l) mile from the project boundary for the wind speed, direction and operating mode that would result in the worst case WTi sound emissions. The prediction model shall assume that the winds at hub height are sufficient for the highest sound emission operating mode even though the enforcement tests will be with ground level winds of l0 mph or less. This is to accommodate enforcement under weather conditions where there is significant difference in the wind speed between ground and hub heights. This condition often occurs during summer evenings when wind shear is affected by the reduction in solar heating of the earth's surface between sunset and sunrise. The projection may be by means of computer model but shall include a description of all assumptions made in the model's construction and algorithms. If the model does not consider the effects of wind direction, geography of the terrain, and/or the effects of reinforcement from coherent sounds or tones from the turbines these should be identified and other means used to adjust the model's output to account for these factors. These results may be displayed as a contour map of the predicted levels, but should also include a table showing the predicted levels at noise-sensitive receptor sites and residences within the model's boundaries. The predicted values must include dBA and dBC values but shall also include un-weighted octave band sound pressure levels from 8 Hz to 10k Hz in data tables. The Town will refer the applicant's information and sound studies to the Town engineer (if qualified in acoustics) or a Qualified Independent Acoustical Consultant for review and a determination whether the proposed WES will, based on pre-licensing studies and sound modeling, comply with the sound limits set forth in this Ordinance. 2. Independent Pre-licensing Sound Modeling. In any case in which a WES is located within one mile of a sensitive receptor the Town shall, and in other cases the Town may, require the preparation of an independent preconstruction noise study for each proposed Wind Turbine location conducted by a Qualified Independent Acoustical Consultant, in accordance with the procedures provided in this section and in the Appendix showing background dBA and dBC sound levels (L90 (10min)) over one or more valid ten (10) minute continuous measurement periods. The preconstruction baseline studies shall be conducted by an Independent Qualified Acoustical Consultant selected by the Town. The Qualified Independent Acoustical Consultant shall be selected and retained by the Town. The applicant shall be responsible for paying the Independent Qualified Acoustical Consultant's fees and all costs associated with conducting the study. The applicant shall provide financial security and reimburse the Town for the cost of the study in accordance with section20.07 of this ordinance. 3. Sound Limits. No license shall be issued unless the prelicensing information and sound modeling shows that the proposed WES will comply with the following sound limits and requirements. (1) No WTi or WES shall be located so as to cause an exceedance of the preconstruction/operation background sound levels by more than 5 dBA. The background sound levels shall be the L90A sound descriptor measured during a preconstruction noise study during the quietest time of night (1Opm until4am). All data sampling shall be one or more contiguous ten (10) minute measurements. L90A results are valid when L10A results are no more than 10 dBA above L90A for the same time period and Ll0C less L90C is no more than 15 dBC. Noise sensitive sites are to be selected based on wind development's predicted worst-case sound emissions (in LeqA and LeqC) which are to be provided by Applicant. 2. Test sites are to be located along the property line(s) of the receiving nonparticipating parcels. 3. A 5 dB penalty is applied for tones as defined in IEC 61400-11. (2) A maximum not-to-exceed sound level of 50 dBC (L90C) from the wind turbines without contribution from other ambient sounds for properties located one mile or more away from state highways or other major roads or 55 dBC (L90C) for properties closer than one mile from a state highway or other major road. These limits shall be assessed using the same nighttime and wind/weather conditions required in section 20.06(a)3.a.(1). Turbine operating sound emissions shall represent worst case sound emissions for stable nighttime conditions with low winds at ground level and winds sufficient for full operating capacity at the hub. Not to exceed 35 dBALeq 10min. within 100 feet of any occupied structure. a. All instruments must meet ANSI or IEC Type 1 Precision integrating sound level meter performance specifications. b. Procedures must meet ANSI 512.9 Part 3 including the addendum in the Appendix to this document. Where there are differences between the procedures and definitions of this document and ANSI standards the procedures and definitions of this document shall be applied. Where a standard's requirements may conflict with other standards the most stringent requirement shall apply. c. Measurements for background sound levels shall be made when ground level winds are 2 m/s (4.5 mph) or less with wind speeds at the hub at or above nominal operating requirements and for other tests when ground level winds are 4 m/s (9 mph). Weather in the night often results in low ground level wind speed and nominal operating wind speeds at wind turbine hub heights. d. IEC 61400-11 procedures are not suitable for enforcement of these requirements except for the presence of tones. 5. Postconstruction� Sound Measurement s.
Within twelve months after the date when the project is fully operational, and within four weeks of the anniversary date of the pre-construction background noise measurements, the Licensee shall repeat the existing sound environment measurements taken before the project approval. Post-construction sound level measurements shall be taken both with all WES's running and with all WES's off. At the discretion of the Town, the preconstruction background sound levels (L904) can be substituted for the "all WES off' tests if a random sampling of 10% of the pre-construction study sites shows that background L90A and C conditions have not changed more than +/- 5 dB (dBA and dBC) measured under the preconstruction �nighttime meteorological conditions. The post-construction measurements shall be reported to the Town (and available for public review) using the same format as used for the preconstruction sound studies. Post-construction noise studies shall be conducted by a firm chosen by the Town. Costs of these studies shall be reimbursed by the Licensee. The security required by section 20.07(c) shall include these costs. The Licensee's consultant may observe the Town's consultant. The WES Licensee shall provide all technical information and wind farm data required by the Independent Qualified Acoustical Consultant before, during, and/or after any acoustical studies required by this document and for local area acoustical measurements. b. The boundaries of all Non-Participating Parcels located within 2,640 feet of any boundary of a Project Parcel. c. The names, addresses and phone numbers of the owners of all Project Parcels, Participating Parcels, and Non-Participating Parcels located within 2,640 feet of any boundary of a Project Parcel. d. An aerial photo showing all Project Parcels, Participating Parcels, and Non-Participating Parcels located within 2,640 feet of any boundary of a Project Parcel. e. Existing zoning of each Project Parcel and all required zoning setbacks on each Project Parcel. f. The proposed location of all components of the proposed WESF, including but not limited to the wind turbine, tower, access roads, control facilities, meteorological towers, maintenance and all power collection and transmission systems. g. The location and description of all structures located on Project Parcels, Participating Parcels, and any Non-Participating Parcel located within 2,640 feet of any boundary of a Project Parcel. h. The location of all above-ground utility lines, telephone lines, and railroad rights-of-way located within 1000 feet of, or three times the total height of a proposed Wind Turbine, whichever is greater. i. The location of all public roads located within 1000 feet of, or three times the total height of a proposed Wind Turbine, whichever is greater. j. Dimensional representation and sizes of the structural components of the tower construction including the base, footings, tower, and blades. k. The distance between each WES tower and each of the following shall be shown on the site plan: structures on all Project Parcels and Participating Parcels; structures on all Non-Participating Parcels located within 2,640 feet of any boundary of a Project Parcel; above ground utility lines, telephone lines, railroad rights of way, and public roads located within 1000 feet or three times the total height of any proposed Wind Turbine, whichever is greater. l. Schematic of electrical systems associated with the proposed WESF including all existing and proposed electrical connections. n. The size and scale of the site plan shall be as determined by the Town engineer. The scale map shall include a north arrow, the date, the scale, and reference to a section corner. o. The site plan shall include such additional information as the Town engineer or Town Board may require. 2. Set-Back Requirements. �A WESF shall comply with the following set-back requirements, which shall apply in addition to the siting requirements in section 20.06(a). a. All parts of a WESF shall comply with all applicable set-back requirements in the Town's zoning ordinance. b. Each Wind Turbine shall be set back at least 1,000 feet and at least five times the rotor diameter from the property line of any Non-Participating Parcel. c. Each Wind Turbine shall be set back not less than the greater of 1,000 feet or three times the total height of the Wind Turbine from any public road. d. Each Wind Turbine shall be set back not less than the greater of 1,000 feet or three times the total height of the Wind Turbine from any above-ground electric power line, telephone line, or railroad right-of-way, except that a lesser setback shall be permitted if the utility or railroad agrees in a writing approved by the Town. e. Each Wind Turbine shall be set back not less than 2,640 feet from any residence, business, school, daycare facility, church, hospital, or other occupied structure on any Non-Participating Parcel. f. Each Wind Turbine shall be set back not less than 1,000 feet from any residence, business, school, daycare facility, church, hospital, or other occupied structure, including on any Participating Parcel or Project Parcel. (c) �Road Use and Risk Assessment Plan and Road Impact Requirements. a. A description and map of all public roads in the Town to be used in connection with the construction of the WESF, including a description of how and when such roads will be used in connection with the construction of the WESF. b. A description of the type and length of vehicles and type, weight and length of loads to be conveyed on all public roads in the Town. c. A complete assessment of the proposed use of roads in the Town in connection with the construction of the WESF, including the adequacy of turning radii; the ability of the roads to sustain loads without damage; the need to remove (permanently or temporarily) signs, trees, utilities, or anything else; any reasonably foreseeable damage to roads or other property; any reasonably foreseeable costs the Town may incur in connection with the use of roads in the Town, including but not limited to costs relating to traffic control, public safety, or damage to roads or property. d. A traffic control and safety plan relating to the use of roads in the Town in connection with the construction of the WESF. e. Any additional information the Town may request relating to the use of roads in the Town in connection with the WESF. 2. The Town will evaluate the road use and risk assessment plan with assistance from such consultants it deems appropriate. The Town may document the condition of all roads to be used in connection with the construction of the WESF in such manner as it deems appropriate. The Town may require changes to the road use and risk assessment plan it deems appropriate to protect public safety, to protect Town roads, and to address anticipated costs to the Town associated with applicant's use of roads in the Town. 3. The Town may require the applicant to enter into an agreement relating to the use of roads in the Town. The Town may require the applicant to provide a deposit or letter of credit in an amount the Town determines appropriate to secure any obligations under the agreement, including but not limited to any obligation relating to alterations or improvements to roads needed in connection with applicant's use of roads in the Town, and the reimbursement of the Town for any costs the road use and risk assessment indicates the Town may incur in connection with applicant's use of the roads in the Town. (d) Desiqn Plan and Design Requirements. 1. Wind Turbines shall be painted a non-reflective, non-obtrusive color. 2. The design of the buildings shall, to the extent reasonably feasible, use materials, colors, textures, screening and landscaping that will blend with and be compatible with the natural setting and the existing environment. 3. Wind Turbines shall not be artificially lighted, except to the extent required by law, and strobe or other intermittent lights are prohibited unless required by law. 4. No advertising or display shall be permitted, other than reasonable identification of the manufacturer or operator of the Wind Turbines or WESF. 5. Electrical controls and control wiring and power-lines must be wireless or below ground, except where wind farm collector wiring is brought together for connection to the transmission or distribution network, adjacent to that network. 6. The clearance between the ground and the Wind Turbine blades shall be not less than 75 feet. (e)� Aircraft Protection Requirements. An application for a WESF License shall include a statement from the Federal Aviation Administration that the proposed WESF will not pose a hazard to aircraft, and a statement from the Wisconsin Department of Transportation that the proposed WESF complies with Wis. Admin. Code � Trans 56. (f)� Blasting Plan and Requirements. An application for a WESF License shall include a blasting plan containing the information and meeting the requirements in this section. The blasting plan shall comply with all requirements under Wisconsin law governing blasting, including ground vibration limits. The plan shall require that flyrock traveling in the air or along the ground shall remain in the controlled blasting area site owned or controlled by the applicant. All blasting must be performed by or under the direct supervision of a state-licensed blaster. A blasting log for each blast shall be kept by the applicant for not less than 5 years, and copies of the required blasting log shall be promptly submitted to the Town upon the Town's request. A resident call list shall be established for the purpose of notifying neighbors at homes in the vicinity of the WESF of blasting activity. The call list shall be maintained and used on a request basis only for all residents in the vicinity of the WESF who ask to be notified before any blast. Explosives shall be stored in accordance with Wis. Admin. Code Ch. Comm. 7. (g)� Microwave Beam Study and Requirements. An application for a WESF License shall include a microwave beam study and electromagnetic interference mitigation plan. All Wind Towers shall be sited in accordance with the findings of the microwave beam study and electromagnetic interference mitigation plan. The applicant shall mitigate any electromagnetic interference such as to radio or television. (h)� Shadow Flicker and Blade Glint Assessment and Requirements. Shadow flicker occurs when the blades of a Wind Turbine pass between the sun and an observer, casting a readily observable, moving shadow on the observer and his or her immediate environment. An application for a WESF License shall include a detailed shadow flicker and blade glint assessment model and plan containing the following information and meeting the following requirements. 1. The model shall be prepared by a registered professional regularly engaged in thistype of work with not less than three years experience. 2. The model study area will examine areas where shadow flicker will occur within a one mile radius of the Project Parcels. 4.� All existing occupied structures, structures permitted for construction and roadways shall be identified within the model as receptors. Each individual receptor that is a residential parcel shall be defined by the perimeter of the building plus an additional 100 foot boundary around the building. Schools, churches, and other public building receptors shall be defined by the entire outdoor area routinely utilized in their operation. 5. The model may be prepared by use of current aerial photography and topographical maps. A site visit by the preparer is required to identify receptors and verify the existing conditions. 6. The model shall calculate the locations and durations of shadow flicker caused by the proposed WESF within the study area. The model shall clearly indicate the duration of shadow flicker at each receptor and across the entire study area showing the total number of hours per year anticipated. a. The flicker will not exceed l0 hours per year at any one receptor measured as the sum of those times during which shadow flicker occurs during any calendar year. b. The flicker will fall more than 100 feet from all existing or permitted residences. c. The traffic volumes are less than 500 vehicles per day on the affected roadway. 8. Problem zones where shadow flicker will interfere with existing and future receptors and which is not allowable under this section shall be identified, and measures to mitigate problems shall be described, including but not limited to siting changes, operational procedures, grading or landscaping. 9. Blade glint, defined as the intermittent reflection of the sun off the surface of the blades of a Wind Turbine, is prohibited. The applicant shall submit a paint sample that demonstrates the color, texture and gloss of the proposed surface coating. The applicant shall also submit a certification by the manufacturer stating that the proposed surface coating will not create a reflective surface conducive to blade glint. (i).� Sign Plan and Sign Requirements. An application for a WESF License shall include a sign plan meeting the requirements in this section. 1. The plan shall provide reasonable signage at the WESF, identifying the Project Parcels as being part of the WESF and providing appropriate safety notices and warnings about trespassing. The no trespassing signs shall be posted as follows: one on each side of each Wind Turbine, and one at the beginning of each access drive to the WESF. Signs shall be sized at a minimum to meet the provisions of Wis. Stat. � 943.13(2). 2. No advertising material or signage other than warning, equipment information or indicia of ownership shall be allowed on the Wind Turbines. This prohibition shall include the attachment of any flag, decorative sign, streamers, pennants, ribbons, spinners or waving, fluttering or revolving devices, but not including weather devices. 3. The WESF licensee's address and phone number shall be posted on each Wind Turbine. (j)� Stray Voltage Assessment and Requirements. 1. An application for a WESF License shall include reports of stray voltage analyses in accordance with this section. The applicant shall conduct and include a report of a preconstruction stray voltage test on all livestock facilities located within a one-mile radius of the Project Parcels. The tests shall be performed by a Wisconsin certified stray voltage investigator approved by the Town. The tests shall be performed according to PSCW Phase II Stray Voltage Testing Protocol. A report of the tests shall be provided with the WESF License application and shall be provided to the owners of all property included in the study area. Applicant shall seek written permission from property owners prior to conducting testing on such owners' property. Applicant shall not be required to perform testing on property where the owners have refused to grant permission to conduct the testing. 2. Following construction of the WESF, the applicant shall conduct a post-construction stray voltage test on all livestock facilities located within a one-mile radius of the Project Parcels. The tests shall be performed by a Wisconsin certified stray voltage investigator approved by the Town. The tests shall be performed according to PSCW Phase II Stray Voltage Testing Protocol. A report of the tests shall be provided to the Town and to the owners of all property included in the study area. Applicant shall seek written permission from property owners prior to conducting testing on private property. Applicant shall not be required to perform testing on property where the owners have refused to grant permission to conduct the testing. (k) Security Plan and Requirements. An application for a WESF License shall include a security plan that contains the information and meets the requirements in this section. 1. All wiring between the Wind Turbines and substations shall be installed not less than four feet underground. 4. Warning signs shall be placed on each tower, all electrical equipment, and each entrance to the WESF. 5. The WESF Licensee shall, in addition to randomized two-token authentication for Internet protection, adopt and maintain physical security protocols including locks and remote intrusion monitoring. (l) Fire Prevention and Emergency Response Plan and Requirements. An application for a WESF License shall include a fire prevention and emergency response plan containing the information and meeting the requirements in this section. The plan shall describe the potential fire and emergency scenarios that may require a response from fire, emergency medical services, police or other emergency responders. The plan shall designate the specific agencies that would respond to potential fire or other emergencies, shall describe all emergency response training and equipment needed to respond to a fire or other emergency, shall include an assessment of the training and equipment available to the designated agencies, and shall provide for any special training or emergency response equipment that the designated agencies need to use in responding to a potential fire or other emergency at applicant's cost. (m) Emergency Shutdown Plan and Requirements. An application for a WESF License shall include an emergency shutdown plan. The plan shall describe the circumstances under which an emergency shutdown may be required to protect public safety, and shall describe the procedures that the Town and the WESF Licensee will follow in the event an emergency shutdown is required. (n) Decomrnissioning and Site Restoration Plan and Requirements. An application for a WESF License shall include a decommissioning and site restoration plan containing the information and meeting the requirements in this section. 1. The plan shall provide for the removal from the Project Parcels, and lawful disposal or disposition of, all Wind Turbines and other structures, hazardous materials, electrical facilities, and all foundations to a depth of not less than 42 inches below grade. The plan shall provide for the removal of all access roads that the owner of the Project Parcels wants removed. The plan shall provide for the restoration of the Project Parcels to farmland of similar condition to that which existed before construction of the WESF. 2. The plan shall provide for the decommissioning of the site upon the expiration or revocation of the WESF License, or upon the abandonment of the WESF. The WESF shall be deemed abandoned if its operation is ceased for 12 consecutive months. 3. The plan shall include provisions for financial security to secure completion of decommissioning and site restoration, in form and amount satisfactory to the Town. A letter of credit, cash on deposit with the Town, or cash held in escrow pursuant to an agreement acceptable to the Town, shall be acceptable security. The amount of the financial security shall be equal to the estimated cost of completing the decommissioning and site restoration in accordance with the approved plan, as approved by the Town. 4. The plan shall include written authorization from the WESF Licensee and all owners of all Project Parcels for the Town to access the Project Parcels and implement the decommissioning and site restoration plan, in the event the WESF Licensee fails to implement the plan. The written authorization shall be in a form approved by the Town. (a) A WESF shall be constructed, operated, and maintained in accordance with the plans required under section 20.06 as approved by the Town, with the WESF License, with the WESF Agreement, and with this Ordinance. Where a standard or requirement is not provided by either this Ordinance, the WESF License or the WESF Agreement, the WESF Licensee shall comply with Good Utility Practice. (b) The WESF Licensee shall repair and replace parts of the WESF in accordance with Good Utility Practice, and in accordance with the WESF License, the WESF Agreement, and this Ordinance. �(c) A WESF Licensee may apply to the Town for changes to a WESF License or WESF Agreement. The application shall describe the requested change or changes. The Town Board shall review the application and determine what provisions of this Ordinance, including sections 20.05 and 20.06, will apply to the application. The application will then be processed in accordance with all provisions of this Ordinance deemed applicable by the Town Board. The provisions of section 20.08 relating to the reimbursement of fees and costs shall apply to any application for changes to a WESF License or WESF Agreement. 1. At the time of the first application, the first applicant would pay $40,000.00 to the Town. b. Second applicant (20 Wind Turbines - 67 percent) = �$26,800.00. 3. At the time of the third application, the total cost would be reallocated among the first, second and third applicants, and the third applicant would pay $1,600.00 to the first applicant and $4,000.00 to the second applicant, resulting in the following allocation. Neither the Town nor any applicant shall recover interest in connection with any costs paid under this section. Payments made at the time of application shall be nonrefundable, notwithstanding the disposition of the application. (c) Preliminay Cost Reimbursement Agreement. At the time an application for a WESF License is filed with the Town, the applicant shall execute for the benefit of the Town an agreement agreeing to pay and providing adequate security guaranteeing payment of the cost of the investigation, review and processing of the application, including without limitation by way of enumeration, legal, engineering, acoustical, planning, environmental, and staff administrative costs. The agreement and the security shall be in form and substance acceptable to the Town. The Town shall not begin processing the application until the preliminary cost reimbursement agreement is approved and signed and until the required security is provided to the Town. (d) Governmental Services Costs. The Town Board may require the WESF Licensee to agree to pay for the cost of Town governmental services reasonably related to the WESF and not otherwise paid by the WESF Licensee. (a) Violations of This Ordinance. It shall be unlawful to construct or operate any WESF or part thereof in violation of any provision of this Ordinance, a WESF License, or a WESF License Agreement. Any person who violates or fails to comply with any provision of this Ordinance, a WESF License or a WESF License Agreement shall, upon conviction thereof, be subject to forfeitures of not less than $250.00 and not more than $700.00, and shall pay all costs and expenses of enforcement, including attorney and other fees incurred by the Town. Each day a violation exists or continues shall constitute a separate offense. (b) Complaints and Modification, Revocation or Suspension. The Town Board shall retain continuing jurisdiction to modify, suspend or revoke all WESF Licenses in accordance with this section. Such authority shall be in addition to the Town's authority to prosecute violations and take other enforcement action. 1. In this section, "violation" means a violation of this Ordinance, or a violation of a WESF License issued under this Ordinance, or a violation of a WESF License Agreement entered into under this Ordinance. 2. Any resident of the Town or Town official may file a written complaint with the Town Clerk alleging that a WESF Licensee has committed or is committing a violation. Such complaints shall be forwarded to the Town Plan Commission. 3. The Town Plan Commission shall preliminarily review the complaint. In connection with its preliminary review, the Town Plan Commission may require the Town building inspector, engineer, attorney or other person or persons to conduct such investigations and make such reports as the Town Plan Commission may direct. The Plan Commission may request information from the holder of a WESF License, the complainant, and any other person or entity to assist with its preliminary review. (5) Take no action, if the Town Plan commission concludes that no further action is needed to discontinue or prevent violations, and that prosecution is unwarranted. (d) Following any such hearing, the Plan Commission's written decision shall be furnished to the WESF License holder and to the complainant. An appeal from a decision of the Town Plan Commission may be taken to the Town Board as provided in this section. (e) An appeal from the decision of the Town Plan Commission may be taken to the Town Board by the WESF License holder or a complainant. Such appeal must be in writing and must specify the grounds thereof, and must be filed with the Town Clerk within ten days after the final action of the Town Plan Commission. The Town Clerk shall provide any appeal to the Town Board. The Town Board shall fix a reasonable time for the hearing of the appeal, and shall give public notice thereof as well as due notice to the WESF Licensee and the complainant. The action of the Town Plan Commission shall be sustained unless the Town Board, by a favorable vote of the majority of all members of the Town Board, reverses or modifies the Town Plan Commission's determination. An appeal from a decision of the Town Board shall be by certiorari review, which shall be commenced within 30 days after the decision of the Town Board. If any section, subsection, sentence, clause or phrase of this Ordinance is for any reason held to be invalid or unconstitutional by reason of any decision of any court of competent jurisdiction, such decision shall not affect the validity of any other section, subsection, sentence, clause or phrase or part thereof. The Town Board hereby declares that it would have passed this Ordinance and each section, subsection, sentence, clause, phrase or part thereof even if any one or more sections, subsections, sentences, clauses, phrases or parts thereof may be declared invalid or unconstitutional. Unless the Town Board approves a different term based on an analysis of the anticipated useful life of the WESF, a license issued under this Ordinance shall expire thirty years after the date it is issued. The potential impact of sound and sound induced building vibration associated with the operation of wind powered electric generators is often a primary concern for citizens living near proposed wind energy systems (WES(�). This is especially true of projects located near homes, residential neighborhoods, businesses, schools, and hospitals in quiet residential and rural communities. Determining the likely sound and vibration impacts is a highly technical undertaking and requires a serious effort in order to collect reliable and meaningful data for both the public and decision makers. This protocol is based in part on criteria published in American National Standards S12.9 - Quantities and Procedures for Description and Measurement of Environmental Sound, and S 12. 18 and for the �measurement of sound pressure level outdoors. The purpose is to first, establish a consistent and scientifically sound procedure for evaluating existing background levels of audible and low frequency sound in a WES project area, and second �to use the information provided by the Applicant in its Application showing the predicted over-all sound levels in terms of dBA and dBC* as part of the required information submitted with the application. * Calculated from one-third octave band sound power levels (LW per IEC 61400-11) provided by the wind turbine manufacturer covering the frequency range from 6.3 Hz to 10,000 HZ or higher. These values shall be presented as overlays to the applicant's iso-level plot plan graphics (dBA and dBC) and in tabular form with location information sufficient to permit comparison of the baseline results to the predicted levels. This comparison will use the level limits of the ordinance to determine the likely impact operation of a new wind energy system project will have on the existing community soundscape. If the comparison demonstrates that the WES project will not exceed any of the level limits the project will be considered to be within allowable limits for safety and health. If the Applicant submits only partial information required for this comparison the application cannot be approved. In all cases the burden to establish the operation as meeting safety and health limits will be on the Applicant. Next it addresses requirements for the sound propagation model to be supplied with the application. Finally, if the project is approved, this Appendix covers the study needed to compare the post-build sound levels to the predictions and the baseline study. The level limits in the ordinance apply to the post-build study. In addition, if there have been any complaints about WES sound or low frequency noise emissions by any resident of an occupied dwelling that property will be included in the post-build study for evaluation against the rules for sound level limits and compliance. The characteristics of the proposed WES project and the features of the surrounding environment will influence the design of the sound and vibration study. Site layout, types of WES(s) selected and the existence of other significant local audible and low frequency sound sources and sensitive receptors should be taken into consideration when designing a sound and vibration study. The work will be performed by an independent qualified acoustical consultant for both the pre-construction background and post-construction sound studies as described in the body of the ordinance. All instruments and other tools used to measure audible, inaudible and low frequency sound shall meet the requirements for ANSI or IEC Type 1 Integrating Averaging Sound Level Meter with one-third octave band analyzer with frequency range from 6.3 Hz to 20Khz and capability to simultaneously measure dBA LN and dBC LN. The instrument must also be capable of measuring low level background sounds down to 20 dBA. Measurements shall only be made with the instrument manufacturer's approved wind screen. A compatible acoustic field calibrator is required with certified + 0.2 dB accuracy. Portable meteorological measurement requirements are outlined in ANSI S12'9 part 3 and are required to be located within 5m of the sound measuring microphone. The microphone shall be located at a height of 1.2 to 1.5 meters for all tests unless circumstances require a different measurement position. In that case, the reasons shall be documented and include any adjustments needed to make the results correspond to the preferred measurement location. An assessment of the proposed WES project areas existing sound environment is necessary in order to predict the likely impact resulting from a proposed project. The following guidelines must be used in developing a reasonable estimate of an area's existing background sound environment. All testing is to be performed by an independent qualified acoustical consultant approved by the Town. The WES applicant may file objections detailing any concerns it may have with the Town's selection. These concerns will be addressed in the study. Objections must be filed prior to the start of the noise study. All measurements are to be conducted with ANSI or IEC Type 1 certified and calibrated test equipment per reference specification at the end of this Appendix. Test results will be reported to the Town or its appointed representative. The results of the model showing the predicted worst case dBA and dBC sound emissions of the proposed WES project will be overlaid on a map (or separate dBA and dBC maps) of the project area. An example (right) shows an approximately two (2) mile square section with iso-level contour lines prepared by the applicant, sensitive receptors (homes) and locations selected for the baseline dBA and dBC sound tests whichever are the controlling metric. The test points shall be located at the property line bounding the property of the turbine's host closest to the wind turbine. Additional sites may be added if appropriate. A grid comprised of one (1) mile boundaries (each grid cell is one (1) square mile) should be used to assist in identifying between two (2) to ten (10) measurement points per cell. The grid shall extend to a minimum of one (1) mile beyond the perimeter of the project boundary. This may be extended to more than one mile at the discretion of the Town. The measurement points shall be selected to represent the noise sensitive receptor sites based on the anticipated sound propagation from the combined WTi in the project. Usually, this will be the closest WTi. If there is more than one WTi near-by then more than one test site may be required. The intent is to anticipate the locations along the bounding property line that will receive the highest sound emissions. The site that will be most likely negatively affected by the WES project's sound emissions should be given first priority in testing. These sites may include sites adjacent to occupied dwellings or other noise sensitive receptor sites. Sites shall be selected to represent the locations where the background soundscapes reflect the quietest locations of the sensitive receptor sites. Background sound levels (and one-third octave band sound pressure levels for the sound measuring consultants file) shall be obtained according to the definitions and procedures provided in the ordinance and recognized acoustical testing practice and standards. All properties within the proposed WES project boundaries will be considered for this study. One test shall be conducted during the period defined by the months of April through November with the prefened time being the months of June through August. These months are normally associated with more contact with the outdoors and when homes may have open windows during the evening and night. Unless directed otherwise by the Town the season chosen for testing will represent the background soundscape for other seasons. At the discretion of the Town, tests may be scheduled for other seasons. All measurement points (MPs) shall be located with assistance from with the Town staff and property owner(s) and positioned such that no significant obstruction (building, trees, etc.) blocks sound and vibration from the nearest proposed WES site. Duration of measurements shall be a minimum of ten continuous minutes for each criterion at each location. The duration must include at least 6 minutes that are not affected by transient sounds from near-by and non-nature sources. Multiple l0 minute samples over longer periods such as 30 minutes or one (1) hour may be used to improve the reliability of the L90 values. The ten minute sample with the lowest valid L90 values will be used to define the background sound. The tests at each site selected for this study shall be taken during the expected 'quietest period of the day or night' as appropriate for the site. For the purpose of determining background sound characteristics the preferred testing time is from 10 pm until 4 am. If circumstances indicated that a different time of the day should be sampled the test may be conducted at the alternate time if approved by the Town. Sound level measurements must be made on a weekday of a non-holiday week. Weekend measurements may be taken at selected sites where there are weekend activities that may be affected by WTi sound. Measurements must be taken at 1.2 to 1.5 meters above the ground and at least 15 feet from any reflective surface following ANSI 12.9 Part3 protocol including selected options and other requirements outlined later in this Section. (2) A narrative description of any intermittent sounds registered during each measurement. This may be augmented with video and audio recordings. (3) A narrative description of the steady sounds that form the background soundscape. This may be augmented with video and audio recordings. b. Wind speed and direction at the Measurement Point, humidity and temperature at time of measurement will be included in the documentation. Corresponding information from the nearest 10 meter weather reporting station shall also be obtained. Measurements taken when wind speeds exceed 2m/s (4.5 mph) at the microphone location will not be considered valid for this study. A windscreen of the type recommended by the monitoring instrument's manufacturer must be used for all data collection. � The layout of the project area, including topography; the project boundary lines, and property lines. � �The locations of the Measurement Points. � �The minimum and maximum distance between any Measurement Points. � �The location of significant local non-WES sound and vibration sources. � �The location of all sensitive receptors including but not limited to: schools, day-care centers, hospitals, residences, residential neighborhoods, places of worship, and elderly care facilities. a. One set of measurements with the wind generator(s) off unless the Town elects to substitute the sound data collected for the background sound study collected as part of an earlier baseline study. Wind speeds must be suitable for background testing. b. One set of measurements with the wind generator(s) running with wind speed at hub height sufficient to meet nominal power output or higher and at 2 m/s or below at the microphone location. Conditions should reflect the worst case sound emissions from the WES project. This will normally involve tests taken during the evening or night when winds are calm (2 m/sec or less) at the ground surface yet, at hub height, sufficient to operate the turbines. Sound level measurements and meteorological conditions at the microphone shall be taken and documented as discussed above. In order to estimate the sound impact of the proposed WES project on the existing environment an estimate of the sound produced by the proposed WES(s) under worst-case conditions for producing sound emissions must be provided. This study may be conducted by a firm chosen by the WES operator with oversight provided by the Town. The qualifications of the firm should be presented along with details of the procedure �that will be used, software applications, and any limitations to the software or prediction methods. Provide the manufacturer's sound power level (Lw) characteristics for the proposed WES(s) operating at full load utilizing the methodology in IEC 61400-11 Wind Turbine Noise Standard. Provide one-third octave band Lw sound power level information from 6.3 Hz to 10k Hz. Furnish the data with and without A-weighting. Provide sound pressure levels predicted for the WES(s) in combination and at full operation and at maximum sound power output for all areas where the predictions indicate dBA levels of 30 dBA and above. The same area shall be used for reporting the predicted dBC levels. Contour lines shall be in increments of 5 dB. Present tables with the predicted sound levels for the proposed WES(s) in dBA, dBC and at all octave band centers (8 Hz to 10k Hz) for distances of 500, 1000, 1500, 2000, 2500 and 5000 feet from the center of the area with the highest density of WES(s). For projects with multiple WES(s), the combined sound level impact for all WES(s) operating at full load must be estimated. The above tables must include the impact (increased dBA and dBC above baseline L90 Background sound levels) of the WES operations on all residential and other noise sensitive receiving locations within the project boundary. To the extent possible, the tables should include the sites tested in the background study. Provide a contour map of the expected sound level from the new WES(s), using 5 dBA and 5 dBC increments created by the proposed WES(s) extending out to a distance of at least 2500 feet from the project boundary or the 35 dBA or 50 dBC boundary whichever is greater. c. Report the predicted sound pressure levels for each ofthe 1/1 octave bands as un-weighted dB in tabular form from 8 Hz to 10k Hz. d. Report all assumptions made in arriving at the estimate of impact, any limitations that might cause the sound levels to exceed the values of the estimate, and any conclusions reached regarding the potential effects on people living near the project area. If the effects of coherence, worst case weather, or operating conditions are not reflected in the model a discussion of how these factors could increase the predicted values is required. e. Include an estimate of the number of hours of operation expected from the proposed WES(s) and under what conditions the WES(s) would be expected to run. Any differences from the information filed with the Application should be addressed. (1) Within twelve months of the date when the project is fully operational, and within two weeks of the anniversary date of the Pre-construction ambient noise measurements, repeat the existing sound environment measurements taken before the project approval. Post-construction sound level measurements shall be taken both with all WES(s) running and with all WES(s) off except as provided the ordinance. (2) Report post-construction measurements to the Town using the same format as used for the background sound study. (3) Project Boundary: A continuous line encompassing all WES(s) and related equipment associated with the WES project. ANSI/ASA S12.9-1993 [Part 3 (R2008) - American National Standard Quantities and Procedures for Description and Measurement of Environmental Sound, Part 3: Short-Term Measurements with an Observer Present. 8 Source(s) Data Collection: All requirements in ANSI 512.18 Method #2 precision to the extent possible while still permitting testing of the conditions that lead to complaints. 8.3(a) All meteorological observations required at both (not either) microphone and nearest 10m weather reporting station. 8.3(b) For a l0 minute sound measurement to be valid the wind velocity shall not exceed 2m/s (4.5 mph) measured less than 5m from the microphone. Compliance sound measurements shall not be taken when winds exceed 4m/s. 8.3(c) In addition to the required acoustic calibration checks the sound measuring instrument internal noise floor must also be checked at the end of each series of ten minute measurements and no less frequently than once per day. Insert the microphone into the acoustic calibrator with the calibrator signal off. Record the observed dBA and dBC reading from the sound level meter or other recording instrument to determine an approximation of the instrument self noise. This calibrator covered microphone must demonstrate that the results of this test are at least 5 dB below the immediately previous ten minute acoustic test results for the acoustic data to be valid. This test is necessary to detect undesired increase in the microphone and sound level meter internal self noise. As a precaution sound measuring instrumentation should be removed from any air conditioned space at least an hour before use. Nighttime measurements are often performed very near the dew point. Minor moisture condensation inside a microphone or sound level meter can increase the instrument self noise and void the data. 8.4 to the end: The remaining sections of ANSI S12.9 Part 3 Standard do not apply. This American National Standard describes procedures for the measurement of sound pressure levels in the outdoor environment, considering the effects of the ground, the effects of refraction due to wind and temperature gradients, and the effects due to turbulence. This standard is focused on measurement of sound pressure levels produced by specific sources outdoors. The measured sound pressure levels can be used to calculate sound pressure levels at other distances from the source or to extrapolate to other environmental conditions or to assess compliance with regulation. This standard describes two methods to measure sound pressure levels outdoors. METHOD No. 1: general method; outlines conditions for routine measurements. �METHOD No.2: precision method; describes strict conditions for more accurate measurements. This standard assumes the measurement of A-weighted sound pressure level or time-averaged sound pressure level or octave, 1/3-octave or narrow-band sound pressure level, but does not preclude determination of other sound descriptors. This Standard describes instruments for the measurement of frequency-weighted and time-average sound pressure levels. Optionally, sound exposure levels may be measured. This standard is consistent with the relevant requirements of ANSI S1.4-1983(R 1997) American National Standard Specification for Sound Level Meters, but specifies additional characteristics that are necessary to measure the time-average sound pressure level of steady, intermittent, fluctuating, and impulsive sounds. This standard provides performance requirements for analog, sampled-data, and digital implementations of bandpass filters that comprise a filter set or spectrum analyzer for acoustical measurements. It super-cedes ANSI S1.11-1986 (R1998) American National Standard Specification for Octave-Band and Fractional-Octave-Band Analog and Digital Filters, and is a counterpart to International Standard IEC 61260:1995 Electroacoustics - Octave-Band and Fractional-Octave-Band Filters. Significant changes from ANSI S1.11-1986 have been adopted in order to conform to most of the specifications of IEC 61260:1995. This standard differs from IEC 61260:1995 in three ways: (1) the test methods of IEC 61260 clauses 5 is moved to an informative annex, (2) the term 'band number,' not present in IEC 61260, is used as in ANSI S1.11-1986, (3) references to American National Standards are incorporated, and (4) minor editorial and style differences are incorporated. � �the wind turbine planner or regulator who must be able to accurately and fairly define acoustical emission characteristics of a wind turbine in response to environmental regulations or permit requirements for new or modified installations. This standard provides guidance in the measurement, analysis and reporting of complex acoustic emissions from wind turbine generator systems. The standard will benefit those parties involved in the manufacture, installation, planning and permitting, operation, utilization, and regulation of wind turbines. The measurement and analysis techniques recommended in this document should be applied by all parties to insure that continuing development and operation of wind turbines is carried out in an atmosphere of consistent and accurate communication relative to environmental concerns. This standard presents measurement and reporting procedures expected to provide accurate results that can be replicated by others. This Ordinance was adopted by the Town Board of the Town of Union at a regular meeting on November 1 3, 2008.